With this USB wall charger, you can energize two USB-charging capable devices, such as smartphones, cameras, MP3 players, iPod/iPhone etc.. Its slim build allows for ultra-portability for on the go charging. ---100% new generic USB wall charger --- 2.1A/10W port for fast charging --- 1.0A/5W port for smaller devices Specifications ---Port Type USB ---Color White ---Input AC 100-240V 50/60Hz 15W ---Output 2.0A/5V/10W ---1.0A/5V/5W Items Included ---One (1) dual port USB wall charger. White US Plug USB AC Home Wall Charger Adapter For iPad 2 3 4 Air Mini 2 Retina Product Features 100% brand new and high quality Suitable for iPad 2 3 4 Air Mini 2 Retina Travel charger for Samsung Galaxy Tab 2 3 7 8.9 10.1 Tablet ,iPhone 5 5S 5C Plug type: US One USB port Dual IC chips protection, anti overcharge, anti over current, anti short circuit. Input: 100~240V 0.45A Output: 5.1V 2. 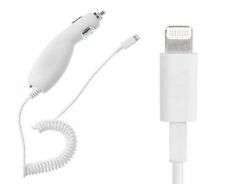 Product Features 100% brand new and high quality Suitable for iPad 2 3 4 Air Mini 2 Retina Travel charger for Samsung Galaxy Tab 2 3 7 8.9 10.1 Tablet ,iPhone 5 5S 5C Plug type: US One USB port Dual IC chips protection, anti overcharge, anti over current, anti short circuit. Input: 100~240V 0.45A Output: 5.1V 2. A US Plug Travel charger for Samsung Galaxy Tab 2 3 7 8.9 10.1 Tablet Product Features 100% brand new,High quality Travel charger for Samsung Galaxy Tab 2 3 7 8.9 10.1 Tablet Good to keep an extra one for travel, at work or when going out of town. Intelligent IC chip to protect your iPad 3 for overcharging and short circuit. Lightweight and Portable. Input: 100V - 220V. Output: DC 5.1V. Features: Travel charger for Nokia Lumia 2520 10", Amazon Kindle Fire HD, iPad Mini and iPad 2/3/4,ipad Air etc. Good to keep an extra one for travelling, at work or when you are going out of town. Intelligent IC chip to protect your device for overcharging and short circuit. Lightweight and Portable. Input: 100V ~ 220V. Output: DC 5.1V. Max: 2100mA. Plug Type: EU Standard SKU:SKU00246 Quantity:1pcs. 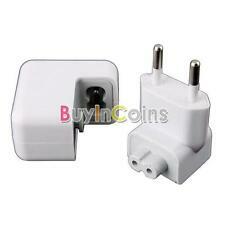 Package includes: 1× 2A EU Plug USB AC Wall Travel Charger Charging Adapter For Nokia Lumia 2520 10" (Without Pack) . Provides standard USB 5V Output. 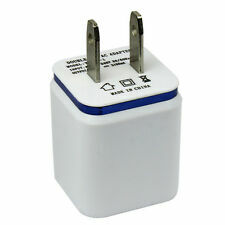 Outlet Plugs: USA Standard Plug. Input: AC 100-240V 50/60Hz. We are Located in Tampa Florida. Color: White. 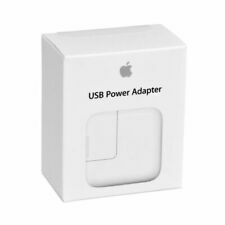 Type Wall Charger Compatible Brand Universal Compatible Product Line Universal Brand Unbranded/Generic UPC Does not apply MPN Does not apply UPC Does not apply. Brand new and high quality. 10W USB Power Adapterlight weight. Made of Durable Hard PlasticPerfect replacement or spare chargerGreen LED light make it more beautifulThe compact size is perfect for travel or homePackage Included: 1x 10W USB Power Adapter (USB Cable is Not Included)Colour: White & GreenType: USInput: 100-240V - 0.45A - 50-60HzOutput: 5.1V 2.1ANote:Light shooting and different displays may cause the color of the item in the picture a little different from the real thing. The measurement allowed error is /- 1-3 cm. Brand Unbranded MPN Does not apply UPC 190268398183 EAN 190268398183 ISBN 190268398183 Designer/Brand Unbranded UPC 190268398183 EAN 190268398183 ISBN 190268398183. Description: 100% brand new,High quality Travel charger foriPad Air iPad 1 2 3 4 5 Mini 2 Retina. Good to keep an extra one for travel, at work or when going out of town. Intelligent IC chip to protect your iPad 3 for overcharging and short circuit. Lightweight and Portable. Input: 100V - 220V. Output: DC 5.1V. Max: 2100mA. 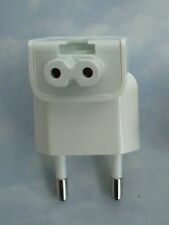 EU AC 100V-220V Plug For Apple iphone ipod ipad Power Adapter. 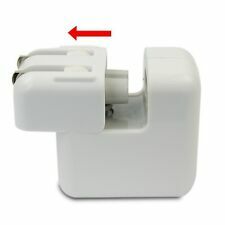 Compatible with Apple AC Adapters: iphone,ipod,ipad ect shullf style. 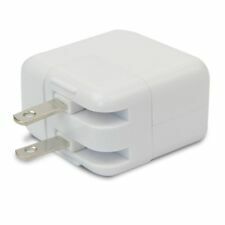 Convert most Apple AC plug to EU style. ● 1 x EU AC Plug. We will be here for you, whatever, whenever. IPad Series. iPhone Series. Color: White. Output: DC 5.1V via USB Port. Input: 100-240V, 12W. For iPad (3rd generation). Current limited, with reverse circuit protection. For iPad 2 (2nd generation). For iPad mini. For iPad mini 2. For iPad (1st generation). For iPad mini 3. IPad Series. iPod Series. iPhone Series. Input: 100-240V ~ 0.45A(0.45A) 50-60 Hz. Color: White. Output: DC 5.4V via USB Port. Output: DC 5.1V 2.1A 10W. Plug type: EU. Plug and play. Small, Compact and light weight design, easy to carry for on the go use. We will do our best to solve problem. You finally saved up for that dream vacation for you and your family. 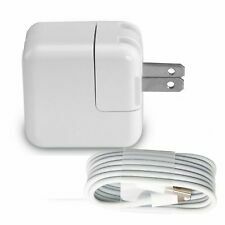 Your bags are packed, your plane tickets are purchased, but you don't know how you'll be able to charge your laptop, your iPhone, your daughter's mp3 player, and your son's handheld video game without causing drama at the socket. Not to worry, best parent in the world! With this 4-Port USB wall charger, one socket can power up to four different USB-compatible devices. No one wants their vacation ruined by fighting, and with this USB adapter, you can leave the drama at home. For tablets, the ports marked "I" are for charging iPads and the ports marked "G" are for charging android tablets. All ports will charge phones. • iPhone 5S,iPhone 5C,iPhone 5. • iPhone 7 Plus,iPhone 7. • iPad Mini. • iPhone 6s Plus,iPhone 6s. • iPhone 6 Plus,iPhone 6. • iPhone 4S,iPhone 4. • iPhone SE. Compatible Models: For iPhone 5/5C/SE/6/6S/6 6S Plus/7/7 Plus/8/8 Plus/iPhone X, iPad, iPad mini, iPad Air, iPad Pro etc. It is also available for local pickup for those in the general Seattle area. 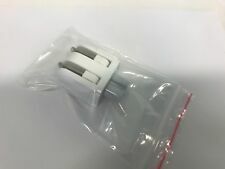 Lot of 20 12W Apple USB Power Adapter Genuine Original OEM Wall Plug for iPad and iPhone. Please note these items are new, but loose. They were removed from iPad boxes. This sale is for the CHARGER only. They still have the factory plastic wrap on them. No charging cable included. 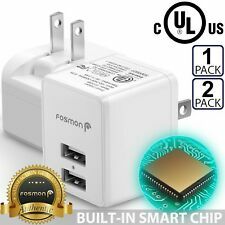 A EU wall charger for Samsung Galaxy Tab 2 3 7.0 8.9 10.1 Tablet Product Features 100% brand new,High quality Travel charger for Samsung Galaxy Tab 2 3 7.0 8.9 10.1 Tablet Good to keep an extra one for travel, at work or when going out of town. Intelligent IC chip to protect your iPad 2 for overcharging and short circuit. Lightweight and Portable. Input: 100V - 220V. Output: DC 5.1V. Max: 2100mA. 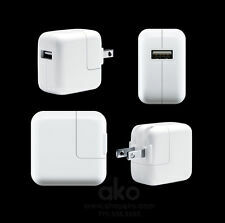 Plug:EU ​ Package includes 1x USB AC Wall Charger For iPad EU Plug.